When it comes to organizing, editing, and sharing photos, most Mac users know iPhoto. But what happens when you don’t feel like plunking down $79 for the latest iLife iteration just to get the snazzy Faces and Places features? Google offers an answer in Picasa, a free photo editing and sharing app that rivals iPhoto ‘09 ( ), excelling in areas, though it’s not without a few shortcomings. 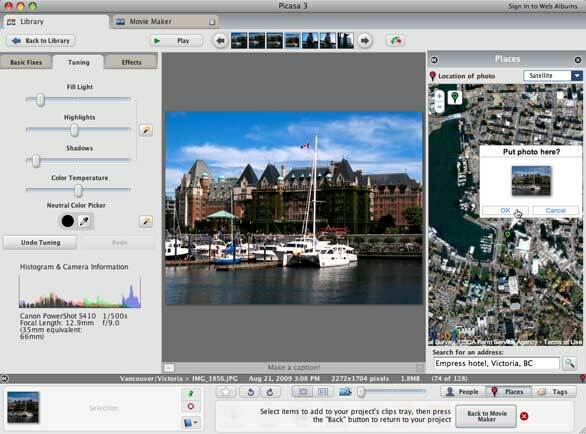 Picasa has only been available for the Mac since January 2009, but it’s popular in the Windows world. If you’ve used iPhoto, Picasa’s feature set will be familiar; you can organize and edit photos, add effects, create albums and slideshows, detect faces, tag places, share pics, print photos and contact sheets, and play movies. But Picasa comes with some nice surprises; you can batch edit photos, create collages, sync your Google contacts, set a pic as your desktop, make movies, sync content with Picasa Web Albums, add text to photos, post photos to Blogger, and upload movies to YouTube. Unlike iPhoto, which imports and stores photos in a single iPhoto Library file, making them difficult to access (unless you set iPhoto to not import images), Picasa scans your Mac for images and movies and displays what it finds in its iPhoto-like-but-less-elegant interface, which possesses some scrolling (but designed that way) quirks. Your photos remain in their original locations for easy access. You can tell Picasa which folders to look through (or avoid) and watch, what types of files to find, and even have it search external drives, DVDs, and network servers. You can also import photos from a camera, media card, your iPhone, or other device; upload the pics to Picasa Web Albums; and share them with your Google contacts all at the same time. 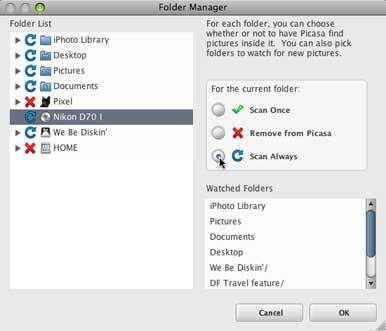 Picasa not only actively searches for images on your Mac, you can set it to look through external drives and DVDs too. Picasa displays all folders that contain images in the Folders section in the left column, organized according to your existing folder array and year; all images contained within a selection appear in the main pane on the right. Like iPhoto, you can double-click any thumbnail to get a bigger view. Unlike iPhoto, you can drag and drop thumbnails within any folder—or to a different folder—to rearrange at whim. Any organizational changes you make affect your actual files, so if you move a photo from one folder to another in Picasa, it moves the corresponding file on your Mac accordingly, and vice-versa. For better organization, you can create Albums, which appear in the eponymously named section above the Folders at the top of the left column. Albums work kind of like iTunes playlists, letting you group together photos any way you want without moving the actual photos. It’s a good way to organize your favorites. In the Picasa world, People and Places stand in for iPhoto’s Faces and Places features. People works a bit differently than Faces, as it automatically starts detecting “people” from the photos it finds, placing them in an “Unnamed” album in the People section, which is sandwiched between the Albums and Folders sections in the left column. It does this a little too well, detecting strangers in a crowd, statues, and other random items, which I ignored. Once you name a person, Picasa creates a new album for that person and adds photos it thinks includes him or her (it can also sync people with your Google contacts). It does a decent job, but it’s not perfect (neither is iPhoto), but you can simply drag and drop the pics it misses. With Places, you can simply type in the name of a landmark and Google Maps will usually find it. With Places, you get the power of Google maps working for you, letting you geotag photos with the location in which it was taken. It works similarly to iPhoto—select a photo and type an address, city, or landmark to tag its location on Google maps. Or drag a thumbnail directly onto the map. I did experience some weirdness where Picasa couldn’t find any location I entered (but iPhoto still could), but this happened only a few times. Picasa includes basic editing tools that make it easy to improve images, and it does this mostly well. The usual accoutrements are here, including tools to fix color, exposure, and contrast, plus tools to retouch (a bit buggy), remove red eye, crop, straighten, and sharpen images. You can also add text (nice!) and effects. And in true Google spirit, there’s an I’m Feeling Lucky one-click photo fixer, which did a good job of making less-than-stellar snaps look presentable. All edits are automatically saved within Picasa—not on your actual photos. When you’re ready to commit, you can either save (which moves your original to a hidden folder) or export (which keeps the original in its same location and lets you control quality, size, and watermarking) your pic as a JPEG. Unfortunately, I had no luck fixing high contrast photos. Picasa provides three sliders to adjust exposure, but using them is a one-way street. You can increase the Fill Light, brighten Highlights, and darken Shadows, but can’t go the other way. When I exposed details in the shadows, I overexposed highlights. When I toned down bright spots, I shrouded my subjects in darkness. A proper color corrector is also needed, as Auto Color and the Natural Color Picker (kind of a white balance fixer) don’t always work suitably. No matter how hard I tried, I could not make this high contrast photo (original on the left, attempts to adjust on the right) look remotely decent using Picasa's Tuning sliders. There are several things that make Picasa stand out. I love the Collage feature, which automatically arranged my photos into a designed or messy layout, which I could then fine-tune. Movie Maker lets you make basic movies (including time lapse) and slideshows. While it doesn’t provide nifty prefab themes or Charlie Brown music to create slick productions (and it exhibited some bugginess when moving photos around the timeline), it does the job well, and the caption feature is especially useful. For photo sharing, Picasa integrates with Google’s own Picasa Web Albums, which gives you 1GB of free Web space, unlike paying $99 a year to integrate iPhoto with MobileMe. Once you sign up for a free account (you’ll need a Google account), you can upload photos, slideshows, and movies to your Picasa Web Albums site. Even better, you can sync Albums and Folders with your site to automatically keep your online and offline collections in sync anytime you edit a photo, add images, or delete them. Your visitors can view your latest adventures, play slideshows, leave comments, make collages and movies of your photos, and order prints. Sure, Picasa Web Albums doesn’t have the eye candy of MobileMe, but I don’t really miss that. With the Collage feature, you can further tweak the layout to your liking. If you use an older version of iPhoto but want the newer features, switching to Picasa is a no-brainer. 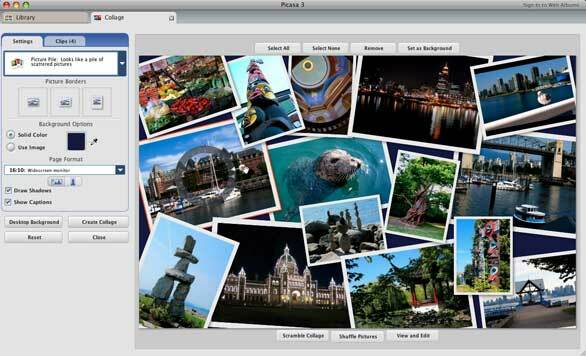 If you use Photoshop or another image editor, Picasa makes a great photo-management companion. It’s free, so why not give it a go?